I got this recipe from the Detroit Free Press. 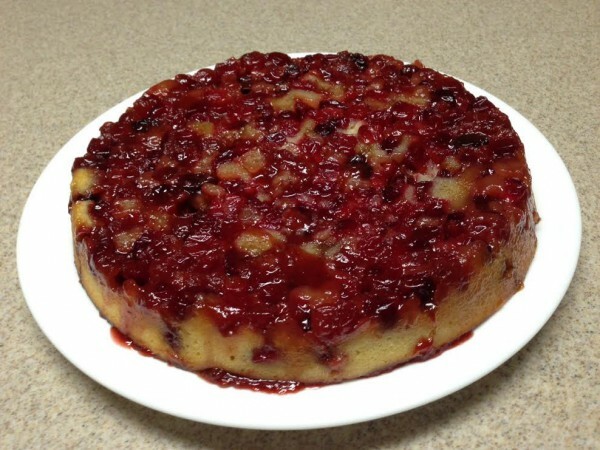 It’s a nice dessert for this time of year, when fresh cranberries are plentiful. And it’s not too soon to start planning for Thanksgiving. This would be a great addition to your feast, or a nice coffee cake to serve at breakfast the day after. It seems like there’s a lot of sugar in it, but it’s really not all that sweet because the cranberries are so tart. Preheat the oven to 350 degrees. Butter a 9-inch round cake pan; set aside. In a large bowl, stir together cranberries, brown sugar, juice, zest and cinnamon. Set aside. Using a stand mixer fitted with the paddle attachment (or a handheld electric beater), beat eggs on high speed until pale, about 2 minutes. Cascade in granulated sugar; beat, 1 minute. Switch the speed to medium and beat in butter, sour cream, vanilla and salt. Sprinkle in flour. Mix on low, just until combined. Scrape cranberry mixture into prepared pan. Cover with cake batter. Bake until fruit bubbles at the edges and a toothpick poked in the cake portion comes out clean, about 40 minutes. Remove from oven and cool on a rack for 5 minutes. Invert a serving plate onto cake pan. Slip on oven mitts. Hold plate and pan firmly together and flip so that plate holds cake, fruit side up. Give the pan a sharp rap to loosen any sluggish berries. Lift off pan. Here’s a very pretty and tasty fall salad recipe. 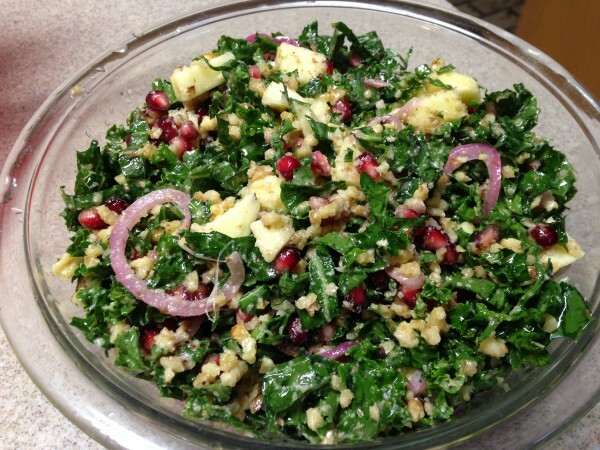 The original was called “Kale, Apple, Walnut and Sumac Onion Tabbouleh.” I don’t know what the actual definition of tabbouleh is, but since it doesn’t have bulghur, parsley or mint, I thought that was a little confusing — although the ground walnuts have a somewhat bulghur-like bite. The original also didn’t include “massaging” the kale, but ever since I started making my Massaged Kale Salad, I’ve been using this technique with all kale salads. It softens the kale and I think makes it a little less bitter. First make the sumac onions. Thinly slice the red onion, add 1 Tbs. red wine vinegar, 1 tsp. ground sumac and ½ tsp. kosher salt and toss to combine. Set aside. Add 1 Tbs. oil and 1 Tbs. lemon juice to the kale in a large bowl and “massage” the kale with your hands for a few minutes until the leaves soften a bit and turn glossy. Combine a quarter-cup of the sumac onions with the rest of the ingredients and toss well to combine. Serve immediately or within a few hours.